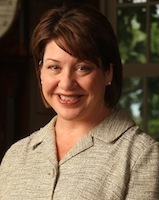 Dr. Margaret Farrar is the Dean of the College of Arts and Sciences and Professor of Political Science at John Carroll. As the College’s chief academic officer, she is responsible for overseeing program quality and review, curriculum development, faculty recruitment, retention, and evaluation, strategic planning, and budget. She works closely with the faculty and administration of John Carroll to create an environment where John Carroll CAS students and faculty can thrive. Dr. Farrar most recently served as associate dean at Augustana College in Rock Island, Illinois from 2009-2014. She also served Augustana as a professor and chair of political science, teaching courses in political theory, U.S. politics, and women’s and gender studies. Dr. Farrar holds a doctorate in political science from Pennsylvania State University. As a political theorist, her research interests include urban politics and the politics of place and memory. Her book, Building the Body Politic: Power and Urban Space in Washington, D.C. (University of Illinois Press, 2008) traces shifts in urban planning discourse over the course of the 20thcentury to show how the functions of cities and citizens have changed over time. She is currently at work on a new project that examines the intersections between historic preservation and environmental sustainability. Please visit our Contact Us page for information on contacting the deans and offices within in the College of Arts & Sciences. CAS Conference Room is located in B101A.